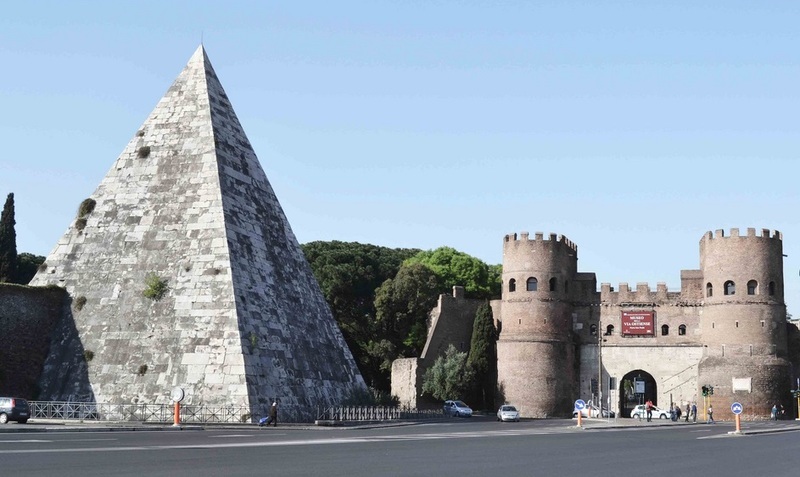 The Pyramid of Cestius is an Egyptian style construction close to the Englishmen’s Cemetery and the IIIrd century gate, Porta San Paolo, in the Aurelian Walls. The Pyramid was completed in the Ist century BC as a tomb for Gaio Cestio Epulone, a member of the religious corporation called Epulones. This pyramid is comparable with the Egyptian pyramids of Giza, but the Roman one has a far more acute angle. Some historians say that it is more similar to the pyramids of Nubia. At that time, Egypt and its culture were extremely popular in Rome, and Egyptian obelisks decorated many squares in the city, so it was unsurprising that a pyramid was built also. The Pyramid of Cestius was built in 330 days. It was made of concrete and covered with Carrara marble. The Pyramid was about 38m in height, and each side of its square foundation was 30m long. In the IIIrd century, the pyramid became part of the Aurelian Walls as a kind of fortification. Inside this construction is only one funeral room. It is so small that its volume is 1% of the total volume of the pyramid. On two sides of the Pyramid can be seen inscriptions: one listed all of the titles and the name of Cestio and the other containing the construction’s details. Great English poets and writers mention the Pyramid in their works. Percy Bysshe Shelley, who was later buried in the nearby Englishmen’s Cemetery, described the Pyramid in his elegy to John Keats and Thomas Hardy, when visiting the tombs of both of these poets, was inspired by the view of the Pyramid to write a whole poem about it. Close to the Pyramid lies Porta San Paolo - the best conserved original gate of the Aurelian Walls. It served as a gate to one of the main roads of ancient Rome – via Ostiense that led to the port of Ostia. That is why it was originally called Porta Ostiensis. When the importance of the road diminished and there began a period when all gates in Rome began to be named after different saints, this gate was called after Saint Paul due to the nearby Basilica of Saint Paul outside the Walls.